The many possibilities for Yasiel Puig suddenly include a trade. DENVER >> Yasiel Puig might return to Major League Baseball with another organization before he plays his next game for the Los Angeles Dodgers. Puig was claimed on revocable trade waivers by a mystery team Tuesday, according to a report earlier today on the website TodaysKnuckleball.com (and confirmed in subsequent reports that the Marlins, Mariners and Braves did not claim him). The Dodgers can try to work out a trade with the claiming team, though such trades are rare. It’s possible that a rival team with no interest in Puig claimed him, merely to block him from being traded to a team that was willing to offer the Dodgers something of value. This kind of gamesmanship is not rare in August. In either case, Puig isn’t among the planned roster call-ups for Sept. 1, when teams can carry up to 40 players on their active roster. Manager Dave Roberts recently said that Austin Barnes and Louis Coleman (who is on the disabled list) would be the first men up, along with Casey Fien, who was activated from the disabled list Tuesday. 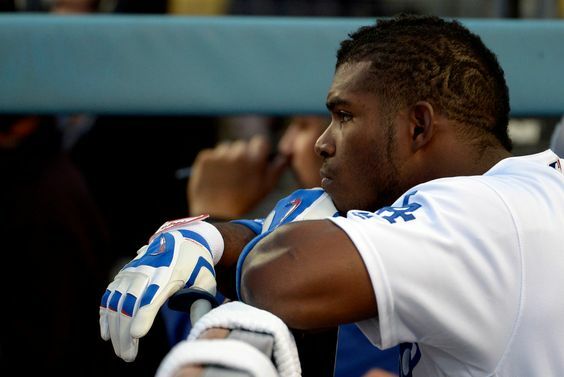 So what is the plan for Puig, who’s slashing .369/.414/.631 at Triple-A Oklahoma City? Friedman would not engage in a cost/benefit analysis of keeping Puig at Triple-A. Earlier this month Friedman condemned Puig’s judgment, but didn’t suspend him, after a series of videos posted to Puig’s Snapchat account showed him partying with his teammates after a loss. Reports on the ground in Oklahoma City indicate that he’s been a good soldier since then. Oklahoma City recently qualified for the Pacific Coast League playoffs, which can last as late as Sept. 20. Friedman declined to assess the costs and benefits of keeping Puig at Triple-A for the duration of the postseason, nor would he rule out recalling Puig at some point in September. “Obviously it’s a short blip in time, close to a month, but he’s done everything that we’ve asked of him in this process,” Friedman said. This entry was posted in Hot Stove, JP on the Dodgers and tagged Austin Barnes, Casey Fien, Louis Coleman, Oklahoma City, Yasiel Puig by J.P. Hoornstra. Bookmark the permalink.